I love Thai food, but I generally try to steer clear of Thai restaurants as there are just too many yummy, tempting, oily foods to "accidentally" eat. My favorite Thai dish is Pad Thai - I absolutely love rice noodles, Thai flavors, and of course the crunch that the crushed peanuts add to the dish. I've made some yummy Pad Thai on my own at home (I will publish my favorite recipe to the blog on a later date), but a lot of the time I don't have time to cook, and I reach for Thai Kitchen's Pad Thai to get a quick Thai fix. Their one serving "Noodle Cart" Pad Thai dish (which I'm specifically talking about today) is pretty yummy, especially considering it is only 250 calories (5 WW points). Not only is this dish a great choice for a light dinner, but it also makes a perfect on-the-go lunch since it comes packaged with everything you need to cook, season, and eat your single-sized portion of Pad Thai (including a plastic fork). 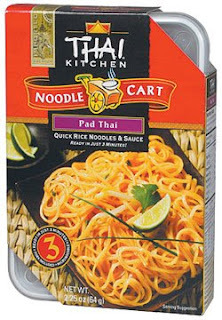 The Thai Kitchen Pad Thai also comes in a bigger box (not called Noodle Cart) so make sure you purchase the one with the right serving size for your needs. Although I think that this Pad Thai is perfectly yummy on its own, I occasionally add 1 WW point of my own crushed peanuts (I weigh them first on my food scale) to the dish to make it a bit more crunchy. Another thing I've done is to buy the Thai Peanut version of the Noodle Cart which is 6 WW points, but overall slightly less flavorful than the Pad Thai version (which is why I usually just add 1 WW point of my own peanuts). Like all the foods I feature, this Pad Thai does not contain any hydrogenated oils, or high fructose corn syrup, so it is a smarter packaged food choice. It is also vegan and gluten-free which I know is a huge plus for those of you with food restrictions. Thai Kitchen also makes a lot of other yummy foods that you might want to check out (even basics like coconut milk, Thai sauces, and rice noodles) that I will write about in future postings. As you know, I love when food sites tell you where you can buy their products. I looked on the Thai Kitchen site and there is a link to see where you can buy their products near you. I buy it at my local Whole Foods. I also made it available at the Yummy Diet Food Amazon Store.